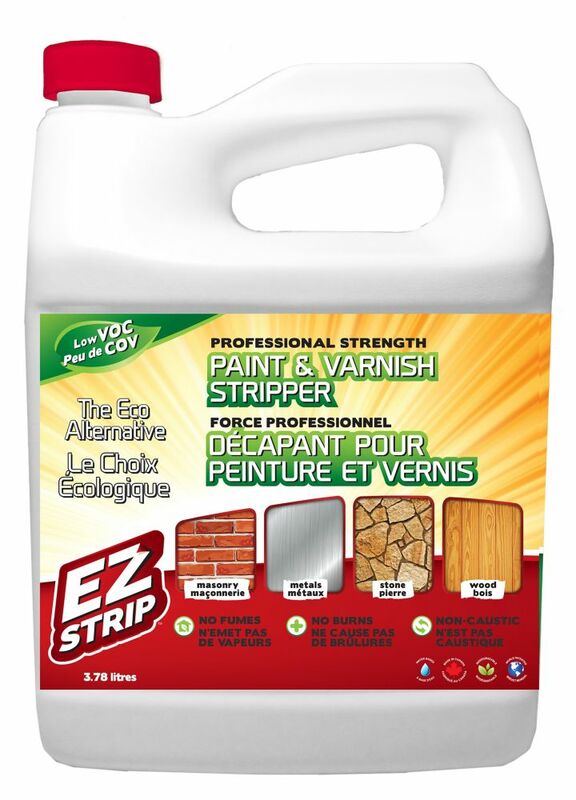 EZ Strip Professional Strength Paint & Varnish Stripper is the ultimate eco alternative to chemical stripping. Our advanced non-toxic formula targets the molecular bond between the coating and the surface, allowing it to effectively soften and lift most unwanted coatings even multiple layers from virtually all surfaces. Super Eco Remover is an effective remover perfect for horizontal and vertical surfaces. It removes latex and oil based paints, urethane and stain on furniture and woodwork. Its unique formula will not dry so it will remain active much longer. It is the ideal product for interior or exterior use. Super Eco remover can be neutralized with water. Restores surfaces to their natural finish. For all people sensitive to the environment Available in Quebec stores only. EZ Strip Paint and Varnish Remover 3.78 L Jug EZ Strip Professional Strength Paint & Varnish Stripper is the ultimate eco alternative to chemical stripping. Our advanced non-toxic formula targets the molecular bond between the coating and the surface, allowing it to effectively soften and lift most unwanted coatings even multiple layers from virtually all surfaces. EZ Strip Paint and Varnish Remover 3.78 L Jug is rated 3.0 out of 5 by 4. Rated 5 out of 5 by Falcon7 from EZ STRIP FIRST TIME AMAZING I bought the 3.78 L jug of EZ StripPaint and Varnish Remover. I absolutely hate strippers with dangerous fumes, required eye and hand protection.But EZ Strip is Canadian genius. I am highly sensitive and loved this product. It says skin safe, but I never use chemicals without gloves. A gentle scent, almost unnoticeable. I researched EZ Strip Youtubes and the EZ Strip Website videos to understand the sequence and technique and timing, but also the huge variety of uses. Shake very very well to be sure the gel is mixed. Keep in your basement but not a garage or outside storage (Do not let it freeze) My first job was a 12 x 12 foot wood panel outside wall. Not knowing what to expect, I taped off patio in plastic protector sheet. I used an extender poll with a thick roller. I used a metal paint tray. Shook well each time I poured, and also recapped to keep the bottle safe from evaporation. Began with about 2 cups, it poured like a gel, thick enough that it would not run down the wall. I rolled a 5 foot wide, 12 foot high section as a test. Timed it for an hour while reading a book there with coffee.Put on dish gloves. I used a Dollarama 6 inch wide stainless steel putty knife, starting at the bottom of each piece of wood and sliding up. I was stunned. Amazing...it simply slid off onto the top of the wide blade and I wiped into a plastic grocery bag. If some areas would not release, I simply painted another layer of EZ Strip just on those pieces. I used a kitchen no scratch blue rectangular scrubbie just with water. Scrubbed each panel and wiped down with fresh water and a J-cloth. The scrubbie removes clean, and clean water final wash down neutralizes the EZ Strip. Fantastic product. As a hobby, I design jewellery and cut and polish and facet stones. I have a special faceting machine called a Raytech Shaw. I painted it with high gloss black...but not thinking...I also painted a round disk that should never have been painted. Even a millineter of paint can destroy the angle of facets of a stone like aquamarine. It is stainless steel. EZ Strip removed it so simply, in about 20 minutes, with just a blue scratchless scrubbie and water.Now doing my basement window frames. So impressed, and PROUDLY CANADIAN. Available in Home Depot Canada. Rated 1 out of 5 by April from What a waste of time! My husband and I just wasted hours. We have a large deck, so we started with one half. Applied as it said to, put plastic on, wait hours....what a mess!!! All it did was make the paint all gummy, impossible to scrape off. You scrape and scrape and it hardly takes anything off. There was only TWO layers of paint to remove. I am returning what's left to the store, I sure hope to get my money back. $40 is an awful lot for a product that doesn't do anything but create a giant mess. It won't even scrub off the deck easy. Just making a sudsy mess, going to take forever to clean up. Please don't waste your time or money. Is this safe to use on kitchen cabinets to remove varnish? Yes solid wood cabinets with varnished coatings can be stripped safely with EZ Strip Paint &amp; Varnish Stripper! For stubborn coatings cover treated surface with plastic (even just kitchen wrap will do the trick) to keep product wet and working during longer set times. Scrape soften material then scrub remaining residue off with water. Allow surface to completely dry before sanding. Hi, is EZ Strip good for removing old coating from concrete stairs? Yes EZ Strip is very effective at removing paint from concrete surfaces. For exterior stairs cover treated area with plastic to keep product wet and working. Once paint is softened (set times will vary) scrub treated area with a stiff bristle brush and warm water. Paint removal from concrete works great with a pressure washer after scrubbing to finish as well. EZ Strip is temperature sensitive so make sure product is used above 10&ordm;C/50&ordm;F.
What is the area of floor the 3.78 L Jug of EZ strip will cover? EZ Strip Paint &amp; Varnish Stripper 3.78L jug will cover approx. 120 - 200 square feet. Coverage is dependent on type and thickness of coating be removed.